Victorian Step by Laura Pavy from The Crochet Case (on BobWilson123). 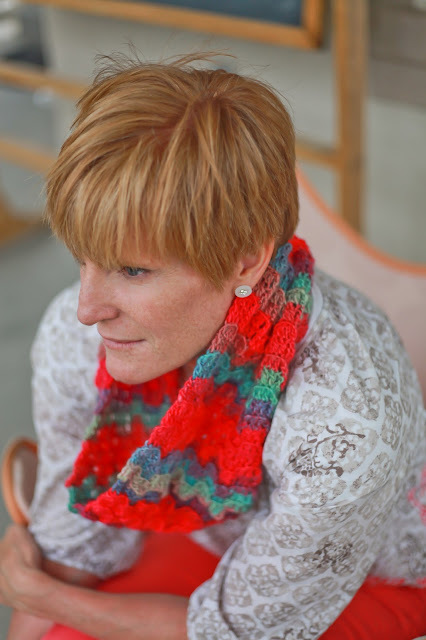 It's adaptable to any size you want--skinny scarf up to king-size afghan. I adore that kind of versatility! I worked mine up in Red Heart Unforgettable (Color: Parrot) which is perfect for the self-striping effect with its long color runs. And I particularly like the texture achieved by working in the back loops only. I began with a chain of 56--or (5 X 10) +6. And then I just hooked along for 59 rows, seaming the cowl loop with a whipstitch. Seriously, easy peasy. And, yes, those are BUTTON earrings! Because BUTTONS are always terrific! Speaking of buttons, I came across these little hooky creations the other day that I made some time ago. This is a simple little felted tie-on earwarmer that I made--with a grouping of buttons, of course. And this is another earwarmer I made with a super large flower and, again, buttons to boot. I don't have patterns, though, so sadly, I can't direct you anywhere. I can probably figure them out to share if you are interested. Let me know in the comments. A very old, very tattered, very terrific Primer. From 1916. With lots of traditional nursery rhymes and stories. Love it!! Some of the people I admire most would have used a book like this as children--possibly this very book. And I like to imagine that they did. I love these kinds of finds! This story is of the wee, wee woman who is scared by a mouse in her wee, wee bowl. B-o-o-h! Simply charming. I'll be back soon. I'm hooking two delightful and interesting new patterns that I'll let you see as soon as I can! Be well. Be peaceful. Be happy. your cowl looks wonderful on you!!!! Thanks, Ale! You are sweet! Oooooh Susan its GORGEOUS!!!! That yarn is lovely too, we've just started getting some red heart in the UK, exciting!! It's really nice to work with, too. But it has a little halo so isn't very good at frogging. Exciting that you can get your hands on some Red Heart. Now if I can get my hands on some Stylecraft! Isn't the worldwide market nifty? Ahhh! Thanks, Kara! That's so kind. Love the cowl - and you look great in it. I understand your photo-phobia as I have it, too. My phobia is real, but yours must be fake - cause you look so good! Thanks for sharing. Thanks, Judy! I think the pattern is really pretty, too. So many possibilities! That stitch is great, I've never seen it before. Your cowl is beatuiful. I love Red Heart Boutique yarn, it's really a great yarn, works up well in so many products. I really like the cowl and the colors! Stopping by from moogly. I love love love the Parrot color from this yarn line. I have a skein of it because I couldn't resist and now I know just what to do with it! Thanks for the inspiration and your lovely photos! You are so welcome! Thanks for stopping by! And thanks for the kind words about my photos! So happy you stopped by! Thanks for the link! And best wishes to you! I used less than one skein for the pictured cowl! I looove these kind of projects! Lovely cowl. I will have to "borrow" this stitch. I too love Red Heart's new Unforgettable yarn. I just used 8 skeins of the Candied to make a crocodile stitch skirt for my niece AND a shawl for my aunt for Christmas presents. The "halo" does make frogging a PITA, but the yarn is gorgeous to work with. Hello Susan, I just happened upon your site tonight and feel like I have found a kindred spirit! I am also a lover of old books and buttons and have been since I was a child. The stitch you used in the cowl is very unique and I can't wait to give it a go, and no worries, you look wonderful...thanks for sharing, I will definitely be back to see what's new!! So happy you found me! This stitch really is so nifty cool! And please come visit again. It's good to "chat" with friends!